Pick and Chews is the fourth book in the Barkery and Biscuits Mystery series by Linda O. Johnston. Also available: Bite the Biscuit, To Catch a Treat, and Bad to the Bone (read my blog post). Pick and Chews is currently on tour with Great Escapes Virtual Book Tours. The tour stops here today for a guest post by the author, an excerpt, and a giveaway. Please be sure to visit the other tour stops as well. Carrie Kennersly tries to help her veterinarian boyfriend when he’s under suspicion of murder … Is he a keeper, or should she let him go off-leash for good? Hi, everyone! I'm Linda O. Johnston, and my wonderful Great Escapes Book Tour continues with my visit here, to Books Direct. 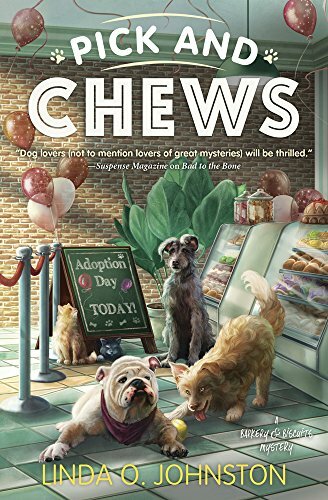 I'm taking this delightful tour because my fourth to Barkery and Biscuits Mystery, Pick and Chews, has just been released. It's a sequel to Bite the Biscuit, To Catch a Treat, and Bad to the Bone. My Barkery & Biscuits Mysteries feature a protagonist who's dear to my heart, Carrie Kennersly, a veterinary technician who decides to do more with her life while keeping her initial career going part-time. In Bite the Biscuit, Carrie had just bought a friend's bakery, Icing on the Cake, and turned half of it into Barkery and Biscuits, where she bakes and sells healthy dog treats she developed as a vet tech. Of course, it's a cozy mystery series, so someone gets murdered and my amateur sleuth has to solve the crime since she's the primary suspect. Since then, she's had to solve a couple more mysteries since friends were the primary suspect. 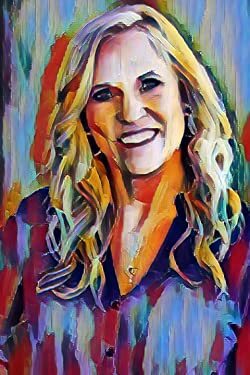 Carrie has developed a romantic relationship with Dr. Reed Storme, a veterinarian who works at the vet clinic where Carrie still works part-time as a vet tech. He's always telling her to back off, not get involved with solving crimes because it's too dangerous. Well, in Pick and Chews, Reed is the major murder suspect ... and guess what? He backs down, at least a bit, from chastising Carrie for getting involved. After all, she survived the other situations - and actually helped solve them. So, is she successful this time? You can probably guess. But to find out for sure, you'll need to read the story! Why is Carrie so special to me? Partially it's because she loves dogs - and I identify with that. It's also because she's living several dreams in her life at the same time. She still enjoys being a vet tech and continues with that career part time. She also has always wanted to be an entrepreneur, and that dream is also coming true with her new shops. These days, I'm a full-time writer and really enjoy it. But when I started writing and getting published, I was also an attorney and practiced law at the same time. Well, not exactly the same time. I got up an hour earlier than anyone else in my household so I had some writing time. At least I got up earlier than any of the humans. I've been owned by Cavalier King Charles Spaniels for many years, and my pups also got up to keep me company. And yes, I enjoyed practicing law, too. In case you're not aware of it, all of my mysteries, and even romances these days, involve dogs! I'd love to hear from you. Come visit my website and friend me on Facebook. I also blog every Wednesday at Killer Hobbies, on the 6th of each month at A Slice of Orange, on the 18th of each month at Killer Characters, and on the first Monday of each month at Under Cover of Midnight, as well as periodically on the Writers in Residence blog. 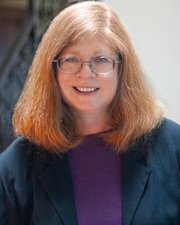 Linda O. Johnston, a former lawyer who is now a full-time writer, currently writes the Barkery and Biscuits Mystery series for Midnight Ink. She has also written the Superstition Mystery series for Midnight Ink and the Pet Rescue Mystery series and Kendra Ballantyne, Pet-Sitter Mystery series for Berkley Prime Crime. Linda also writes the K-9 Ranch Rescue miniseries for Harlequin Romantic Suspense, as well as a paranormal romance miniseries for Harlequin Nocturne. And all her current stories involve dogs. Enter the tour-wide giveaway for a chance to win one of two print copies of Pick and Chews by Linda O. Johnston (US only). Buckaroo Buckeye by Kristin Anderson Cetone is currently on tour with iRead Book Tours. The tour stops here today for a guest post by the author, an excerpt, and a giveaway. Please be sure to visit the other tour stops as well. “Who is talking?” the little nut asked. “I am NOT worthless,” cried the little nut. But the other nuts only laughed and mocked him. Besides Writing, I am a Reading Specialist and taught for many years in the public schools. As an author and entrepreneur, I now offer reading assessment and reading tutoring through Nuts About Reading™ my online, supplemental reading screen and tutoring for grades 1-3 and their parents. I use a video-conferencing format for children from their own home computers. Parents can observe but can not coach the child. SAFE-CONVENIENT-AFFORDABLE. 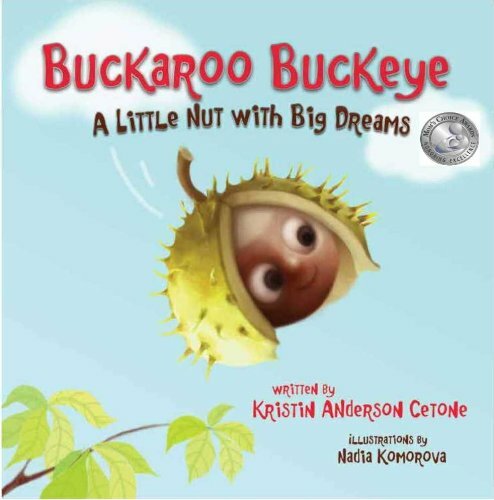 Buckaroo Buckeye is the story of a tiny little buckeye nut seed who falls from his tree in Ohio. The other buckeye nuts bully him and call him worthless. 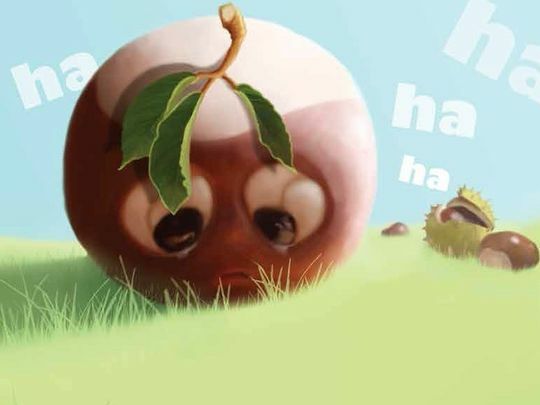 He is determined to prove the other nuts wrong and find his special place in the world! He is picked up by a young girl walking near the tree and she carried this little nut home. The little girl knows the legend surrounding a buckeye nut. She knows they are carried for good luck. The little girl also loves the stories of the old wild west, so she transforms her buckeye nut into a cowboy and names him Buckaroo. The little girl’s life journey goes many miles and all along this journey, she carries Buckaroo with her, a friend for good luck. They get separated along the way and Buckaroo continues his journey of self-discovery alone. He must rise above bumps and bullies along the way. Will he give in to his self-doubts? Will he find his special place of worth and prove the other nuts wrong? Born in Dayton, Ohio, she traveled many miles before putting down roots in the Arizona desert. 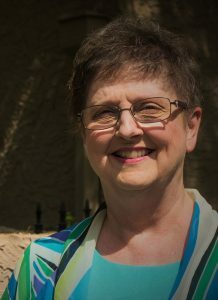 Influenced by family, education, life experiences, and a desire to teach others, Mrs. Cetone discovered her purpose - just like Buckaroo Buckeye did. Enter the tour-wide giveaway for a chance to win a signed copy of Buckaroo Buckeye plus a $5 Amazon gift card (US/Canada only). 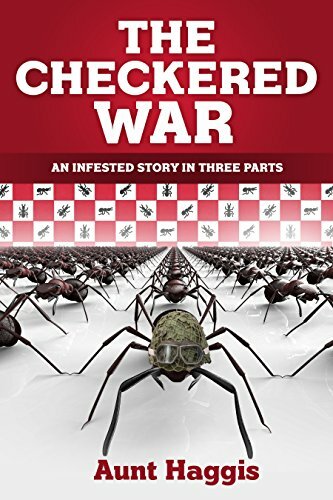 Aunt Haggis stops by today for an interview and to share an excerpt from her first children’s book, The Checkered War: An Infested Story in Three Parts. A feud is raging between three colonies. Although the Harvesters, Carpenters, and Blood Red Slave Hunters have been fighting since last year, this summer will secure a lasting victory for only one of them. This is the story of war and feast and … no, not famine … more feast! The war raged between the three colonies. Although they had been fighting since the last year, this summer would secure a lasting victory for only one of them. The Harvesters lived near the paved road beside a large and spacious wheat field. Their rival, the Carpenters, lived west of where the road splits into a bumpy and dusty path leading into the abandoned forest. The Blood Red Slave Hunters lived wherever they pleased. Everyone was afraid of them. "We should attack from the rear," Ada recommended strongly. "It worked last year, it will work again." Ada was an average-sized soldier, average color, average strength and weight. Her outstanding quality was that she was more industrious than most. She prided herself on being dependable. Ada stood more erect to increase her height. “The rear attack always works,” she repeated for emphasis. "I disagree," Minolt retorted. Minolt flexed her forelegs. She marched up closer to the front of the group. "That's exactly what they're expecting us to do: attack from the rear. We need an element of surprise." Minolt’s jaw tightened, and her eyes darted back and forth, seeking supporters. "She's right," an advisor chimed. "Minolt is always right." Minolt gloated and threw a victorious smirk toward Ada. The group began to grumble. Ada looked around the room for defenders of her plan. “And it always works," she added quickly. "Not this year," said Minolt acidly. She moved in closer to Ada, breathing hotly on her face. "If you had a few brains, you would realize that this situation is different. We're not just dealing with the invasion and seizure of goods, but with an opposing army, a BIG army.” Minolt thrust her front legs high into the air. “We have to get there first,” she continued resolutely. “We have to encircle the battleground. We have to move swiftly. We have to approach unnoticed.” Her eyes pierced Ada’s entire being. “Get it?” Minolt backed away, shaking her head in disgust. Some of the advisors were beaming at Minolt’s forceful, sarcastic speech. Ada knew everyone was staring at her. She could feel her throat tighten and the hair on her legs quiver. She thought she might faint from embarrassment until the Queen stepped down from her seat. Queen Opal methodically paced around the chamber, each council member scurrying to get out of her way. Whispers, murmuring, an increasing rustle began to crackle through the crowd. "We don't have any wood," blurted out a soldier. "It would be too heavy," called someone else. "We're not Carpenters. We're Harvesters," another cried. "I know, I know," answered the Queen, louder and more impatiently than she expected. "Not a real Trojan horse,” she explained, “but an 'edible' Trojan horse.” She wrapped her front legs around her head and tried to calm herself. She paced back and forth, then suddenly commanded, “Now everybody leave. I need to draw up the plans. Prepare your divisions for labor." The Queen pointed to the door. "Go! Go! Go!" The advisory board left the Queen's chambers, mumbling among themselves that she’d lived too long, given birth to too many children, and now was slipping into insanity. Queen Opal was also mumbling, but to herself, "Oh boy, oh boy, an edible Trojan horse! How ever will I do it?" Willy sat huddled in a dark corner of the Queen’s chambers. Unlike the rest of the colony, he was the only one who was from the Black-Haired Garden colony. He had been adopted last spring after he’d been swept off the bank of the Spanky River during a rainstorm. Miles downstream he had been washed up onto a log. After drying out, he had crawled into the cattle barn of the Harvester colony and had become one of them. Willy had immediately gone to work milking the herd. Unlike the other males in the colony who were lazy and useless, Willy was a solid worker who did his share. Although his co-workers called him overly enthusiastic, Willy considered it a compliment. No one seemed to notice he was Black. Willy wanted so badly to help his new colony. Like an enemy spy, Willy had squeezed into a dim nook of the Queen’s chambers, straining to hear the words of the advisory board. As an outsider to the council as well as the colony, the advisory board would never have invited Willy to the meeting. Only he wasn’t a spy; he was just a lowly worker who wanted to make a difference. Now as he contemplated the upcoming battle, his dream of being a war hero kicked into gear. He wanted to help his colony win the war. He knew he would have to use brains, not strength, to assist his Queen. Try as he might, Willy didn't know how to make an edible Trojan horse. He wanted to come up with a solution for the Queen. He thought, and thought, and thought until his mind became tired. His tiny legs were weak from being scrunched up for so long in the dingy corner. Then he fell asleep. Ants are a wonderful People. 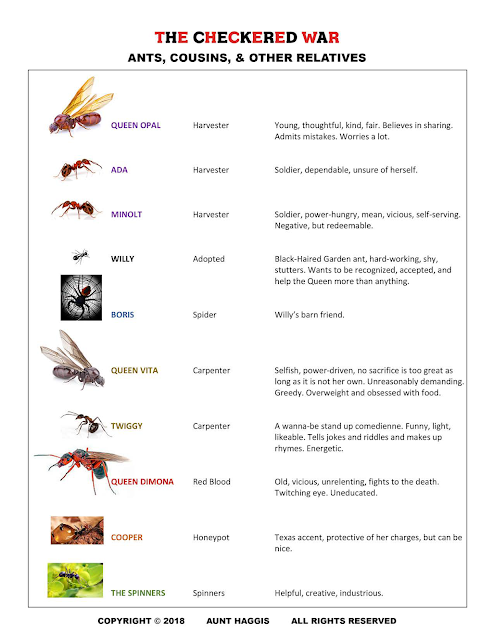 They belong to the order of insects called Hymenoptera. There are billions of them upon the earth, and there are over 12,000 known species. If you carefully study them, you will see that they have some of the virtues and many of the vices of human beings. They have surprising talents and can perform many different tasks. Because they live in organized communities with a highly specialized division of labor, they are known as social insects. Ants live, work, and sleep just like other peoples. But they are not as industrious as you might think. Some species never work, wandering around like parasites feeding off other colonies. Some are thieves and robbers, while others are killers and cannibals. Just like the human race, ants can be their own worst enemy. Ants live in a caste system where there are three distinct groups: the queen, the workers, and the males. Like human queens, the queen ant is in charge; she has servants that take care of her. The workers are not so lucky; they work their entire lives. All of the workers are sterile females. Males don’t work at all, and only live in the nest at mating time. After mating, the males soon die. In most species, the males have the best vision, the females have eyes that don’t work very well, and the workers have the poorest eyes. In some species, the workers are even blind because there is no optic nerve. Still, some have no physical eyes at all. The brain, however, is another matter. Generally, it is barely developed in the males, improved in the females, and the most well-developed in the workers. 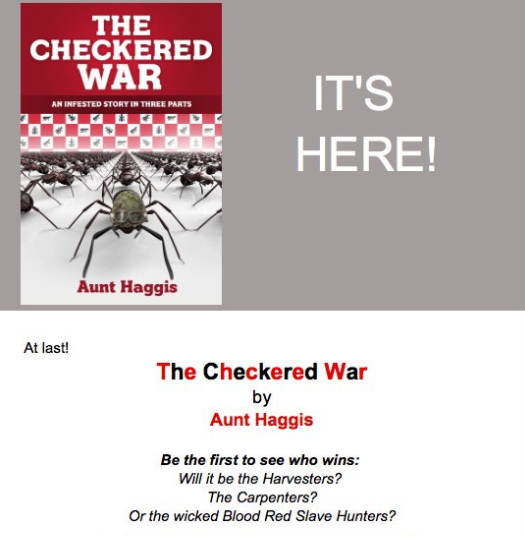 Aunt Haggis joins me today to discuss her new children’s book, The Checkered War. Geared for ages 7-14, The Checkered War is innovative children’s literature that takes an unusual twist on genre by mixing action and adventure with both fact and fiction. While immersed in a thrilling and exciting story, young readers learn fascinating facts about science. 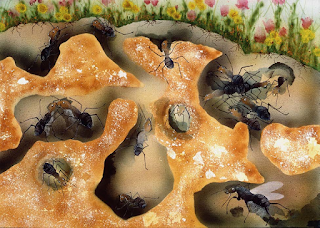 I became fascinated with ants when I bought an ant farm for one of my kids for Christmas. The idea that my child could view and study these tiny, industrious creatures was intriguing. And I would be teaching him something new and fun. But the box remained unopened. For two years. One day while cleaning out his closet, I noticed the ant farm smothered in a pile of clothes on the floor. Apparently, he still wasn’t fascinated, intrigued or mildly interested. So, I took the box to my downstairs home office and set up the ant farm. Then with the coupon I found inside, I sent away for my live harvester ants and impatiently waited. Finally, the ants arrived, and I was elated! I carefully poured the contents of the plastic vial into the ant farm, not letting a single ant escape, and voila! Instant ant farm! After a brief awakening to their new home, the ants set to work. I watched fascinated as nature’s tiniest engineers dug tunnels, built roads, and erected bridges. They built room after room, segregating their living space, and never quit working! As I excitedly observed them day by day, I began to notice things they do that are just like humans, only better. They work together quietly, quickly, and efficiently. 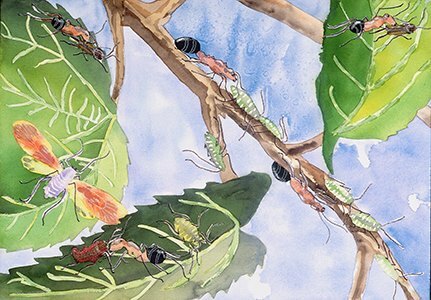 Without training, classrooms, or the Internet, the ants figured out how to cooperate with each other, working as a unit to build a colony, find food, and take care of their young. Simply stated: ants are pure inspiration. The Ant Facts. I wanted them to be correct and precise, so I did an enormous amount of research, reading several books, including a 732-page encyclopedia-like scientific volume entitled The Ants. Wow! How do you hope this book affects its readers? 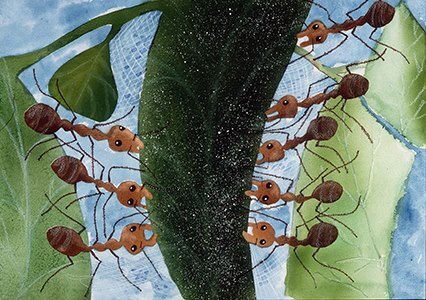 My desire is that all ages of readers will become fascinated with ants, as well as other small creatures that we know so little about, and perhaps not pre-judge their sophistication and importance in our world. To quote a young reader who read The Checkered War, “I really got into The Checkered War. I learned a lot about the army, war, and especially ants. I don’t think I will ever step on an ant again.” ~ Rory – Age 13. The Checkered War took me one year to write. Half of that time was spent on the illustrations. I knew what I wanted them to look like, but I knew nothing about the art of air brushing. So, I bought a couple of books and started practicing until I got the nine illustrations right. Impressive! What is your writing routine? I write every day for four to six hours. I spend the rest of the day plotting and planning, making outlines and, most of all, researching needed information to make sure it is correct. I self-published it on Amazon's Kindle. Great advice! What do you like to do when you're not writing? Photography, reading books, researching interesting topics, cooking, riding my bike, rafting wild rivers and, most of all, hanging out with my family. I literally grew up on the river studying nature, rafting wild whitewater rapids, basking in the sun, and sleeping under a canopy of brilliant constellations. When I wasn’t looking up to examine the stars at night, I was looking down by day to investigate the most intriguing of creatures … ants. You will find my discoveries in The Checkered War. I have always loved books and great stories. I read at least one book every week as a child ... I still do. I wrote my first short story while I was in elementary school. When I went to college, I thought I had to do something more noble, like go to medical school or law school. Every time I changed my major, I changed it back to English and creative writing. Seven times! My childhood experiences have influenced everything I do, from the way I connect with my family and friends, to the way I write stories, relate to my readers, and conduct business. When I was younger, it was Judy Blume I loved. She told a great story and made me laugh at the same time. Now I like thrillers and suspense and mysteries ... any of the great writers hitting the big book lists. Over one hundred children between the ages of ten and fourteen in Indiana, Illinois, and Utah have read The Checkered War, including two middle school literature classes. Their responses were overwhelmingly positive; they loved the story and the scientific facts. The students commented on format, vocabulary level, and general interests and their suggestions were incorporated in the final draft. Teachers I have interviewed are enthusiastic about a new way to teach both literature and science. They have stated that they would like to include the book in their teaching curriculum. I also plotted the reading level on the Edward Fry Readability Graph, confirming its suitability for grades 5, 6, 7, and 8. Parents and younger children were also enthusiastic about the book. Whatever my readers beg and plea for, I will deliver! I hope The Checkered War is the first in many of its kind to come, as I am a true believer in combining fiction with fact ... and who's to say where to draw that line? Thank you for taking the time to stop by today, Aunt Haggis. Best of luck with your future projects. Aunt Haggis is a published author, photographer, and outdoor enthusiast. She literally grew up on the river studying nature, rafting wild whitewater rapids, basking in the sun, and sleeping under a canopy of brilliant constellations. When she wasn’t looking up to examine the stars at night, she was looking down by day to investigate the most intriguing of creatures ... ants. You will find her discoveries in The Checkered War.